Survivors get bruised. A lot. And for the sake of this post, we will stick to just the physical bruises. Little bruises. Big bruises. Layers of bruises. Different levels of healed bruises. Every imaginable type of bruise happens. Blooming blossoms flowering along the skin in brilliant shades of black, purple, red, yellow, brown, and even a slightly sickly shade of green. An abstract Impressionist painting of trauma. Whether from trauma or illness, needles or I.V. 's, blood thinners or infection, or a general weakened woozy state that makes your footing not so steady so you bump into things a bit more often- bruises are going to happen. Some bruises are super sensitive while others have a dull ache. Some linger for extended periods of time and most are rather unsightly. There is not a lot you can do about them for the duration. 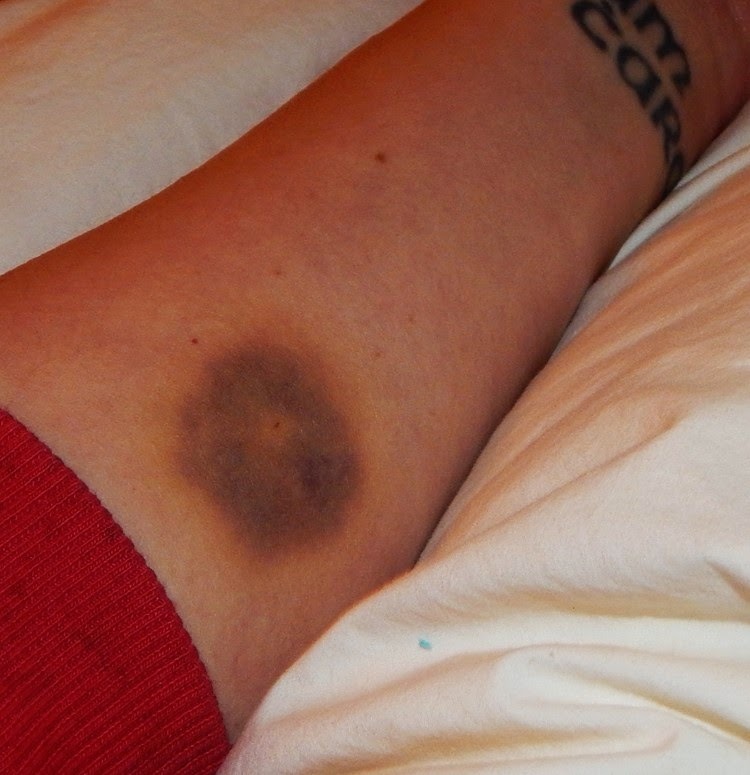 Usually a bruise is yours to keep for ten to fourteen days. Treating a bruise is more an art then a science. But there are some tricks that sometimes help in controlling their severity, pain level, speed of fading, and length of stay. Try to find a trick that works for you. Always consult a doctor if bruising occurs when you have no apparent source while ill, if bruising occurs while taking blood thinners, if bruising while severely anemic, the bruising is on the face or head, the bruising swells, doesn't heal or fade, and is accompanied by severe pain or a fever. In the end, bruises are just a body's natural way of dealing with trauma, and if you are bruising, you are still surviving. Being alive, even if bruised, is a good thing.